Summary: Conversen makes it easy to generate dynamic messages across multiple channels. It's more a supplement than a replacement for conventional campaign management but should save a lot of work for marketers and their agencies. One of the fundamental challenges in database marketing is that a seriously sophisticated campaign may send different messages to hundreds or even thousands of customer segments. The traditional approach has been to define these segments during the selection process, creating a tree with one end-point for each segment, and then to assign the appropriate message to each end-point. The problem is that this requires creating hundreds of versions of the messages and making sure that each is matched to the correct end-point. This is both labor-intensive and error-prone. An alternative is to create "dynamic content" the messages that select the appropriate contents for each individual. In essence, this is moving some of the segmentation logic from the selection process to inside the message. Even though this ultimately produces the same number of variations, it lets marketers create fewer messages and segments, reducing manual effort. Let’s take a concrete example. Suppose you’re sending offers for winter vacation travel. People in New York will be sent offers for Florida and people in Los Angeles will get offers for Mexico. In addition, people in high-income zip codes will be offered a deluxe package while those in middle-income zip codes get an economy offer. 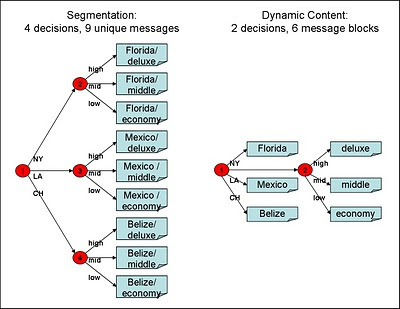 A segmentation-based approach would use three segmentation rules (New York or Los Angeles; if New York, high or middle income; if Los Angeles, high or middle income) to create four segments, each tied to a separate message. A dynamic content approach would require just two decisions (New York or Los Angeles, high or middle income) that are each tied to a specific content block. It’s still possible to make a mistake: you could accidentally link the Mexico offer to New York. But each assignment is made only once so it’s easier to be sure it’s correct. 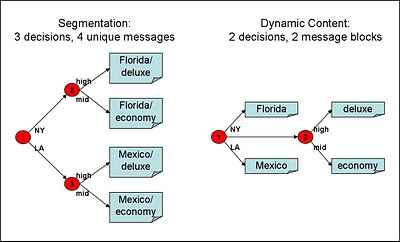 Note that the advantage of dynamic content increases as you add complexity: a three city-pair, three level program would require four segmentation rules (one for city, three for city/level combination) and nine unique messages, while dynamic content still needs only two rules (one for city, one for level) and six message blocks (three destination cities, three luxury levels). So where’s the catch? Well, dynamic content requires the marketing automation vendor to work inside the message itself, using different technologies for each medium. This is significantly trickier than just pointing each segment to a message created elsewhere. One way to avoid this complexity is to generate a file containing the customer records and segmentation variables and let channel-specific output systems generate the customized messages. But this adds its own costs and risks, since the external systems must be configured separately for each project. As a practical matter, most high-end marketing automation vendors have compromised by providing dynamic customization for email and Web pages, and letting external systems handle the other channels. Conversen has taken a different approach, building a specialized system to support dynamic content across as many channels as possible. This puts it in a somewhat confusing business position, since it can sometimes replace a traditional campaign management system but more often receives output from one. Resolving this confusion is largely Conversen's own problem, however, since it sells to marketing service providers rather than end-users. Conversen is organized primarily around campaigns. These include filters to select an audience, processing steps and content. The key here is consistency: the rules used in filters, steps and dynamic content are exactly the same. It's not just that they're built with the same interface and run against the same data structures: the same rule can actually be used for any purpose. Rules can also be shared across multiple campaigns and referenced within other rules. This reuse substantially reduces the number of rules needed, and thus both the effort and opportunity for error. The rules themselves are quite powerful, extending beyond the usual selections on field values to include advanced features such as if/then/else loops. One gap is missing support for a/b testing, which Conversen decided to omit because it added too much complexity. The system doesn’t maintain an audit trail of changes to each rule, but does provide reports listing everywhere each rule is used. This helps to avoid unintentional consequences when a rule is changed. Rules connect with data gathered from source systems through batch processes or a real-time API. The resulting database is stored in Microsoft SQL Server and hosted by Conversen. This is important point, since it means that Conversen doesn’t simply attach to an existing marketing database. Although moving data into a separate database does add some cost, it also provides options to maintain persistent customer histories, combine data from multiple sources, and directly capture events such as campaign responses. The system includes basic features to define data structures and map data from external sources into those structures. Load maps can include basic rules for whether to update or append matching records, but more advanced processes such as name/address matching have to be done externally. Users who don’t need any of these functions could simply send Conversen the output files from a conventional campaign manager. This costs no more than loading files into any other message delivery system. The heart of Conversen are the marketing messages. Conversen defines each message as an XML template. This holds any static elements plus the rules used to select content blocks. The blocks themselves are created outside of Conversen and stored in a content library. This is another example of Conversen drawing the line between its core functionality and supporting functions to be handled elsewhere. It also probably reflects the reality that content will be created by external vendors, such as ad agencies, who will want to use their own tools in any event. Lack of an integrated content-builder does mean that personalization tokens such as [First Name] must be manually embedded within the content block. This can be done in the original content creation system, requiring a relatively inconvenient cut-and-paste from a list provided by Conversen, or be added after the content is loaded into Conversen. Each Conversen content block currently supports a single medium. Thus, there would be separate content blocks for 10% discount in email, Web, direct mail, mobile and other types of messages. Conversen is working on multi-media content blocks that could be inserted into any medium. This would further simplify marketers’ lives. One Conversen campaign can deliver multiple messages over time, based on dates such as a contract expiration or recent activity, or on events such as promotion responses. The system can react to qualifying events at regular intervals or in near-real-time as they are posted. Clients can also build custom interfaces by direct access to the Conversen API. This lets them create branded systems and offer specialized portals with limited functionality. These might give designers access to the content-management features of the system, or make predefined campaigns to available to field offices. Conversen supports email, mobile (SMS), RSS feeds such as blog posts, print, call center and Web. The system provides specialized services for each channel, such as rendering to preview emails and postal sorting for direct mail. Print output is integrated with Bitstream PageFlex, which supports direct output to high-speed printers. Conversen sends the digital messages itself and ships print and call center files to third parties for execution. The system also provides operational reporting on campaign volume and responses. The reports are designed to provide activity information rather than detailed marketing analysis. Conversen was introduced in 2007. The company now has about 25 marketing agencies as customers, serving more than 125 end clients. The system is offered only as a Conversen-hosted service. Pricing includes a $15,000 setup fee plus $1 to $20 per thousand messages based on volume and type. Summary: a new survey from ExactTarget shows that digital marketing is growing faster than database marketing or mass media, and that agencies have a harder time adding digital capabilities than their clients. It also suggests that marketers are moving into digital channels even when they can’t measure their value very well. No surprises in any of this, but good to see confirmation of previous research. - digital marketing budgets are growing faster than marketing in general (66% plan to increase their digital budget in 2010, vs 46% planning to increase their total marketing budget). Database marketing channels (email, direct mail and telephone) are growing at lower rates (54%, 27% and 26% plan to increase, respectively), while mass media (television, newspapers/magazines and radio) are lagging the most (20%, 17% and 15%). Note that these are just the percentage of companies planning a budget increase; the actual average increase in digital budget was 17%. The average proportion of budget spent on digital was 24%, which is higher than other figures I’ve seen, suggesting the respondents were more digitally oriented than the industry as a whole. - lack of skills is the key impediment to digital growth: lack of staff, company culture and lack of digital understanding were three of top four problems (after lack of budget, which was number 1). Inability to measure ROI and lack of business case ranked only ahead of “other”. 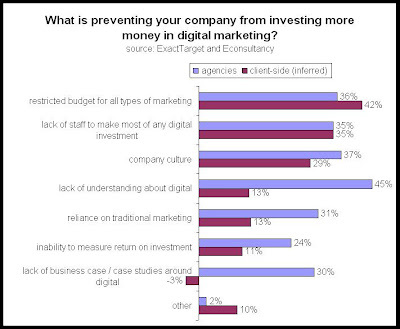 What is preventing your company from investing more money in digital marketing? - agencies are more constrained than marketers by lack of skills. “Lack of understanding about digital” was cited by 45% of agency respondents, compared with about 13% of client-side marketers. * My interpretation is that clients can always go and hire a digital agency if they need to add the expertise, while the agencies themselves find it much harder to expand their offerings. In fact, although 35% of both groups apparently cited “lack of staff” as a problem, they may mean different things. Agencies are probably referring to lack of staff with digital marketing skills. Client-side marketers probably mean lack of staff to oversee digital programs executed by an outside agency. 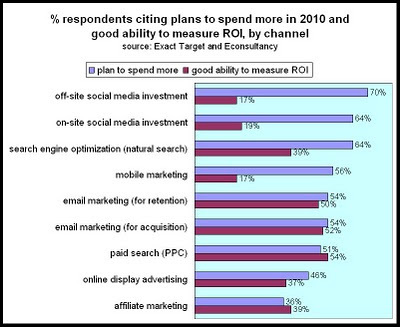 - The fastest-growing digital channels (social media and mobile) are the least measurable. In fact, there’s an almost inverted relationship between growth rates and measurability. This probably reflects that fact the fastest-growing channels are the newest, with least-established measurement methods, rather than a perverse hostility to measurability. In this context, it’s also worth noting that agencies felt much more hobbled by lack of ROI and business cases than client-side marketers, and that a very-hard-to-believe 65% said their company measures marketing effectiveness based on ROI. These further reinforce the view that marketing measurement isn’t a top priority when moving into new digital channels. * The published materials show total and agency figures. I've estimated values for client-side marketers based on the numbers of respondents reported for the two groups: 648 client-side, 385 agency/supplier-side. This won’t be precisely correct, since everybody didn’t answer every question. Hence that -3% response to "lack of business case" for client-side. 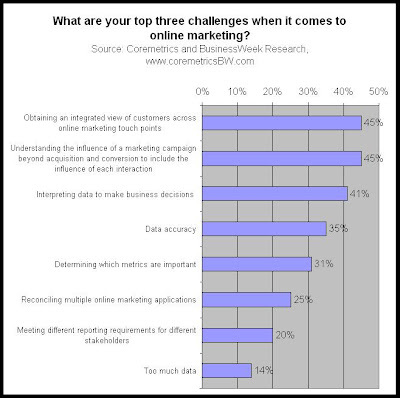 Summary: a survey sponsored by Coremetrics shows that online marketers are eager to merge data from multiple sources. This is the long-term solution to closing the gap between database and digital marketers. I was debating yet another post on database vs digital marketing when I saw a Direct Newsline headline that said “Online Marketers Talk The Talk, But Don't Walk The Walk”. The accompanying article suggested the online marketers don’t give personalization a high priority, which supports the theme of my last few posts. Sweet. But reality proves a bit more complex. The article referred to a survey of online marketers sponsored by Web analytics vendor Coremetrics. As the headline suggests, about three-quarters of the marketers listed personalized email, display advertising and onsite pages as a high priority, but just under half are actually using them. So, yes, there’s more talking than walking. 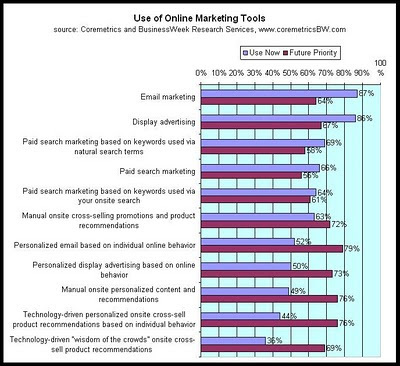 But a closer look* shows that the “future priority” numbers are also related to current deployment: items like basic email marketing have low future priority scores because they’re already in widespread use. So the apparent discrepancy in the personalization rankings is less because online marketers don’t really care about it, than because they’ve had other, more fundamental things to do first. If I were feeling particularly tendentious, I could argue other data in survey supports my claim that digital marketers are relatively disinterested in personalization. For example, “manual onsite cross-selling promotions and product recommendations” has a higher deployment rate (63%) than “manual onsite personalized content and recommendations” (49%). But a simpler explanation is that personalized recommendations are just technically harder. Indeed, the two “technology-driven” options, recommendations based on individual behavior and on “wisdom of the clouds”, have the lowest of all current deployment rates. That said, it’s still interesting that the survey shows personalized email (52% deployed) as not significantly more common than personalized advertising (50%) or personalized site content (49%). This seems to contradict my position: if email is run by personalization-oriented database marketers, while Web advertising and (perhaps) site content are run by behavioral-targeting-oriented digital marketers, then email personalization should be more common. But the actual question asks about email, display advertising and onsite content which are personalized "based on individual online behavior”. This adds the additional constraint of whether marketers have been able to tie (mostly anonymous) online behavior to other channels. That constraint applies across all the delivery channels, and is likely why the deployment rates are so similar. Surely the vast majority marketers are personalizing their email using information in their databases, particularly if you extend the definition of "personalization" to include segmentation that determines which messages are sent to whom. 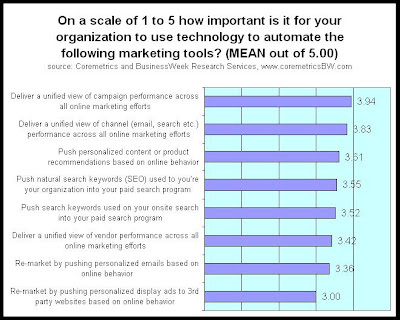 A separate question asked marketers to rate the importance of automating different marketing tools. What's interesting about those answers is that five of the top six didn't involve individual-level data: three are about campaign, channel and vendor performance, and the other two are about search keywords in aggregate. The only exception, "personalized content or product recommendations based on online behavior" is based on reusing data within a single channel, which means that individuals need not be personally identified. (The survey makes clear that its definition of "personalization" includes treatments based on anonymous behavior tracking.) Actually, the two applications that do rely on consolidating personal data across channels are the lowest ranked of all the options presented. I'd say this supports my fundamental contention that digital marketers are mostly concerned about non-personal, channel-specific applications. On the other hand, respondents did rate “obtaining an integrated view of customers across online marketing touch points” as their highest challenge, or at least as a tie with measuring marketing impact. Since it was only listed by 45% of the respondents, I could speculate that those might have been the database (email) marketers in the group, while the digital (Web) marketers could have all ignored it. But I’m not inclined to bother: I have no problem believing that digital marketers are perfectly willing, even eager, to consolidate data across channels when it’s possible. My main point is consolidation is generally not possible because most digital touchpoints do not collect identifiable, addressable information. (See yesterdays’ post for my definitions of those terms.) And, because consolidated data is often not available, the digital marketers have learned to work without it. By contrast, Coremetrics is focused on a future (or, perhaps, imaginary) world where data-gathering techniques have improved. Coremetrics is arguing, and I fully agree, that consolidating data across channels does add value and that marketers should be willing to invest in making it happen. In fact, if I hadn’t seen the survey this morning, my intent was to write about the convergence of database and digital marketing, precisely because digital marketers are increasingly aware of the value and possibilities of working from a consolidated database. So even though I’ve been arguing that database and digital marketing today are quite different, I do think they’ll become more similar over time as each group learns from the other. The marketers themselves are already leading in that direction, and vendors who want to survive will surely follow. * very close indeed. Sorry for the small print in the charts. It's the best I could do. The actual data is available in the surveys. Summary: Database marketing and digital marketing are more different than it seems. It's hard for experts in one to adjust to the other. Yesterday’s post touched briefly on what I see as a fundamental transition between database marketing and digital marketing, and in particular on the changes that marketers and their supporting vendors must make to navigate the change successfully. This is an important topic, so I thought I’d return for a closer look. It’s self-evident that digital marketing (mostly on the Internet, but also mobile, in-game, and eventually interactive TV) is a major change from both traditional mass media and more recent database marketing (mail, email, telemarketing, CRM). What’s less obvious is that the skills and attitudes that have served database marketers well for the past twenty or more years – an entire career for many – don’t transfer to the digital world. It’s true that database and digital marketing are both technology-enabled and thus seem as if they should draw on similar talents. But the similarities are superficial while the differences are profound. Let’s cut to the core of the matter: the first rule of database marketing is that whoever has the biggest database, wins. Database marketers strive to gather ever-more information about their customers and (to a lesser extent, because less data is available) about their prospects. Their Holy Grail is the ever-receding “360 degree view of the customer,” a phrase I’ve always disliked because (a) it treats the customer as an object and (b) no one can possibly know everything about their customers. Today, at least to my mind, it also conjures up a full-body scan X-ray, an image I hope enough people find so offensive that it will finally put the phrase to rest. Sorry for the rant. My point is that database marketers’ ideal is a perfectly detailed customer database, which would allow them to target precisely the “right offer to the right customer at the right time.” This attitude leads to highly structured, finely segmented campaigns and carefully-plotted, rules-driven interaction flows which make the best possible use of whatever data is actually available. Digital marketers have no such illusions about the completeness of the data they could ever hope to assemble. I’m not saying many of them wouldn’t like to identify each person they interact with, just that this is obviously impossible in most situations. Thus, digital marketers start from a premise that they’ll be interacting with people cloaked by varying degrees of anonymity, and look for ways to make the best use of the limited information available. In one case this might a search term they used to reach a Web site; in another it might be a history of movies they and others have rented; in yet another it might be their current physical location. Most innovations in digital marketing involve improving the value extracted from such limited data, rather than attempting to link the data to an identity that can then be enhanced with large volumes of personal information from other sources. A corollary to the limited and contextual nature of most digital customer data is that marketing programs don’t have enough information to make reliable predictions about the most appropriate treatments. Thus, multi-step marketing campaigns or highly structured interaction dialogs are less useful than simply giving people a variety of choices and letting them guide the process for themselves. Again, this is a matter of degree: deciding which choices to present itself requires predictions about which items the customers will prefer. But presenting multiple choices is quite different from trying to guess in advance which one is best. In other words, we’re talking about a loss of control over the marketing process. This is still more obvious at the start of the marketing cycle, when companies are first attracting customers into a relationship. Database marketers spend lots of effort acquiring and enhancing prospect lists so they can decide whom to approach and which offers to send them. By contrast, most digital marketing contacts are initiated by the prospects themselves in response to an advertisement or social media message. Certainly digital marketers can select their advertising audiences, but this resembles traditional media buying more than an outbound direct marketing campaign. Even (or, perhaps, especially) with social media interactions, the marketer has very little control over what is communicated to whom. Indeed, even though database marketers do plenty of acquisition, I think it’s fair to say that they find it relatively frustrating because the available data is generally so limited. Most would probably prefer to work on customer management – cross sell, upsell and retention – where richer data is available. By contrast, digital marketers have happily embraced the notion of “inbound marketing”, which is precisely the art of attracting new people to their products. To speculate still further, the reason that business marketers are adopting marketing automation much more enthusiastically than they ever adopted traditional database marketing may be that business marketing automation is largely being used in acquisition-friendly digital media, and business marketers are more acquisition-oriented (i.e., focused on lead generation) than their consumer marketing brethren. Control is also a major differentiator when it comes to marketing measurement. Perhaps the proudest claim of database marketers is that all their efforts are highly and precisely measurable. Reality is a bit more messy, but it’s true that database marketing does support proper champion/challenger testing for companies willing to make the investment. Digital marketing also supports such testing. But many digital efforts involve display advertising where at least some of the value comes from exposures that do not prompt immediate, measurable activity. This is another area where digital marketing more closely resembles traditional mass media advertising than anything else. In fact, digital marketers increasingly base their measurements on consumer panels and surveys, almost precisely duplicating the conventional mass media approach. Again, the fundamental point is a difference in attitude: database marketers treat precise measurement as their ideal, even though they realize it isn’t fully attainable. Digital marketing doesn’t permit that illusion, so its practitioners can more easily accept less exact approaches. By now I’ve probably annoyed many of my friends in both the database and digital marketing industries. Let me make clear that I’m not arguing that database marketing is obsolete or somehow inferior to digital marketing. They do different things and will coexist, just as mass media survived when database marketing appeared. In fact, good marketers will learn to integrate them effectively, letting each do what it does best. Actually, I’d argue that rule- and data-driven Website personalization has more in common with classic database marketing than with most digital marketing methods. In that case, integration between the two types of marketing happens within the Web site itself. Nor am I arguing that database and digital marketing have nothing in common. Both are, obviously, dependent on technology and both are measurable in their own ways. Both work with customer databases – in fact, as digital marketers get better at capturing and integrating customer data, they will find themselves increasingly reliant on database marketing techniques. And, of course, both ultimately perform the basic marketing tasks of understanding their customers and using that knowledge effectively. Rather, I’m trying to show that different skills and assumptions are needed for success in the two areas, and to suggest that this makes it difficult for people and organizations to transition from one to the other. This, in my opinion, is why the direct marketing agencies, marketing service providers and marketing software vendors who dominate the database marketing industry have not transferred their leadership to the digital marketing channels. The only new medium they easily adopted was email, but that was essentially database marketing to begin with. This doesn’t mean that database marketing vendors are inevitably doomed or trapped in a shrinking specialty. But it does mean that those firms must recognize the fundamental differences between their old industry and the new one. They cannot make the easy but false assumption that digital marketing is a natural extension of database marketing techniques. Only the marketers and vendors who aggressively embrace digital marketing in its own terms will be able to lead the new industry.